Nature has provided herding animals and flocking birds with abilities to react to predator attacks and to sense risky features in their environment— like trees or cliffs—that might impede their defense. But how do these abilities work? What’s going on inside individual animals and the group as a whole as they protect themselves with coordinated movements? New research by a University of Maryland alumnus and faculty member published in the current issue of the Proceedings of the Royal Society A explores how an avoidance signal from a single animal closest to the danger can quickly spread through the collective. The researchers developed mathematical models of optimal control that capture imitative behavior in a collective as if a “master clock” governs all group members. "Optimality, reduction and collective motion" (RSPA 20140606) was written by University of Maryland alumnus Eric Justh (EE Ph.D. 1998), Electronics Engineer at the Naval Research Laboratory; and Professor P. S. Krishnaprasad (ECE/ISR). When engineers and biologists make models of flocks, they envision them as composed of individual agents (self-steering particles) with free will to control actions such as turning or escape based on perceptual feedback—what they sense is going on in the environment. A collaborator in Italy—Dr. Andrea Cavagna—shared three-dimensional position data from observations of large flocks of European starlings (numbering in the hundreds) displaying striking flight behavior. His team’s analysis of the data investigates information transfer in a flock using Hamilton’s equations arising from the application of statistical physics principles. The Maryland team formulated an optimal control problem for flocking and derived Hamilton’s equations based on principles of optimality associated with Pontryagin and others. These insights from the study of nature have practical implications. For example, they can be used to devise algorithms for collective behavior in robotics. Justh and Krishnaprasad’s findings may lead to the creation of new algorithms for networked robots to work together on tasks such as vigilance. Recent work in the Intelligent Servosystems Laboratory is pursuing these avenues of research. The work of P. S. Krishnaprasad was supported in part by the Air Force Office of Scientific Research under AFOSR grant no. FA9550-10-1-0250, and the ARL/ARO MURI programme grant no. W911NF-13-1-0390. The work of Eric Justh was supported by the Office of Naval Research. 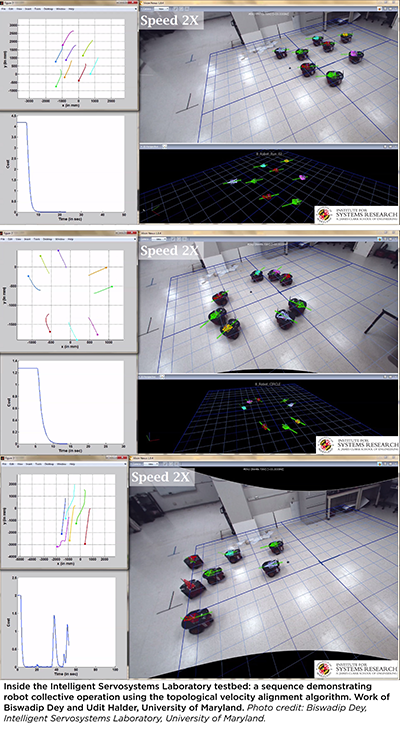 For a number of years, Dr. Krishnaprasad has been working with students to demonstrate motion control software tools on mobile robots in the University of Maryland’s Intelligent Servosystems Laboratory. The laboratory is equipped with a testbed that uses motion capture technology to explore ideas and algorithms in cooperative autonomous robots. Learn more about Dr. Krishnaprasad’s work in the research section of his website. Examples of wave phenomena in starling flocks may be found in the following two videos on YouTube.